Are you ready to learn everything there is to know about AlkaViva’s flagship water ionizer, the Vesta H2? AlkaViva is one of the pioneers in the United States alkaline water industry and one of the few companies to include built-in molecular hydrogen infusion technology in their new line of H2 ionizers. I previously reviewed the Athena H2, which is AlkaViva’s mid-range option. The Vesta model is AlkaViva’s most premium countertop alkaline water machine. In this review, we’ll go over the features, filters, installation, and current AlkaViva customer reviews before leading into my review. I’ve researched quite a few ionizers, and I can tell you up front that AlkaViva manufactures some of the best water ionizers in the world for a smaller price than several other brands charge for similar features. One of the things I like most about AlkaViva is the amount of effort they put into designing their filters. I have yet to see another company offer a more thoroughly tested filter than the dual filters in the H2 series ionizers. AlkaViva filters are independently tested by an EPA/NELAP certified lab, and the lab results speak for themselves. Out of the 172 contaminants tested, almost all of them are reduced by 99.9%. Even the toughest contaminants to remove including arsenic, chromium VI, lead, and volatile organic compounds (VOCs) are nearly undetectable after passing through an AlkaViva filter. Also, you know exactly what’s in the filters since they’re manufactured right here in America. Click here to see a full PDF of the lab results provided by AlkaViva. AlkaViva uses highly efficient silver & zeolite-impregnated carbon in its filters to get the incredible lab results they make public. Not many other ionizer companies are putting forth this much effort to ensure the consumer drinks the cleanest water possible. In addition to carbon, UltraWater filters contain bio-ceramic balls and bioceramic tourmaline, two key ingredients in a premium water ionizer filter. Each AlkaViva UltraWater dual filter set can filter up to 1000 gallons. If you live in an area with hard water, you may experience a decrease in flow rate over time. This is normal and easily fixed with a citric acid wash. The AlkaViva self-cleaning system works for the long haul in most cases, however, those people with hard water may want to run an annual citric acid wash to remove any hard water buildup inside the machine. Even the much more expensive Kagen Water machines require citric acid cleansing. Out of the box, the Vesta comes with everything you need to install it as a countertop water ionizer. Anyone can easily follow the instructions to get the unit up and running in no time at all. For those of you who want to save your valuable counter space and go with an under-sink installation, you’ll need to purchase the separate under sink kit designed to work with all AlkaViva’s H2 water ionizers. AlkaViva is one of the pioneers in the U.S. alkaline water industry and has been in business since 2002. They have an A+ rating with the Better Business Bureau and stand behind their ionizers with a lifetime warranty. They manufacture their ionizers in South Korea with Japanese technology. Japan and South Korea are the leading alkaline water authorities in the world. Only South Korea and Japan have certification systems in place that guarantee you’re buying a medical-grade water ionizer. 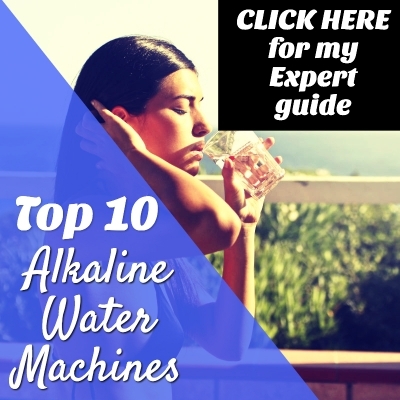 Other leading alkaline water machine brands that manufacturer their ionizers in Japan and Korea include Life Ionizers, Tyent, and Kangen Water. You can rest assured that you’re buying from a legit company when you purchase an H2 series ionizer from AlkaViva. Plus, H2 series ionizers are some of the only ionizers on the market that produce molecular-hydrogen rich alkaline ionized water – the healthiest water in the world. Molecular hydrogen boosts the alkaline water benefits you’re already getting from drinking alkaline ionized water. You can also click here to check out some amazing testimonials written by people who changed their lives with the help of ionized water, including cancer survivors. Overall, I put the AlkaViva Vesta H2 ionizer right up there with the best water ionizers in the world. The good part is AlkaViva charges significantly less for its ionizers, especially when compared to Enagic’s Kangen Water machines. What I like most about AlkaViva is they don’t cut corners or add unnecessary fluff to their machines. Everything in their design is there for a reason, to optimize the way their water ionizers function. The advanced self-cleaning feature is something I haven’t seen offered by most other ionizers companies. Plus, the filtration system in the AlkaViva Vesta is the best I’ve seen in any ionizer I’ve reviewed. Their filters are more expensive than most other brands, but in my opinion, they’re more than worth the money. For an ionizer to do its job properly, your water needs to be as free of contaminants as possible before entering the ionization chamber. I give the Vesta a big thumbs up! Click Here to check out the current lowest price for the Vesta H2. You may also be interested in my AlkaViva Athena H2 Review that contains extra info about molecular hydrogen benefits and several other interesting goodies about AlkaViva.